I know. It’s Monday. It’s raining. And if you’re like me you’ve eaten all of your black jelly beans. Also the red and orange ones. Also the yellow ones. And you’re down to the reject colors like white and pink. Seriously, does anyone like white jelly beans? Why do they even make them? But cheer up! You’re here, among friends, in our happy little corner of the blogosphere! And I have someone awesome for you to meet, AND you could get a present! Today I am so excited to be introducing a fabulous author/illustrator to you all. Please give a warm welcome to the wonderful and talented Lisa Thiesing! Hi Lisa! Thanks so much for joining us today!! Hi Susanna! Thanks so much for inviting me! I’m excited to be here! LT: I first became interested in children’s books when I was very little. My mother always read to me and she was very excited about all the new books that were coming out at the time. Things like the Little Bear books and Eloise were brand new! Can you believe it? Eloise was a character I particularly related to since I grew up in Manhattan, just a few blocks away from you! We even had a mail chute by the elevator. It was tempting but I never did pour water down it! Oh! and Harriet the Spy…. I often ran around the park pretending to be her. These characters seemed so real and were my friends. My mother would also point out interesting things in the drawings, like how a certain expression on a character was just so perfect for the story. She made books seem important and fun. Also, this is probably bad, but she would let me stay home “sick” from school so that I could work on my tremendously original novel about Old Boy, a dog that was constantly saving his boy from falling down wells and other disasters. LT: I was definitely encouraged by my mother. I was VERY shy as a girl and I think she saw writing and drawing as my way of communicating. LT: The story comes first. When I write a story, what usually happens is that a certain phrase will keep repeating in my head. Sometimes it’s the beginning of the story, sometimes it’s the ending. 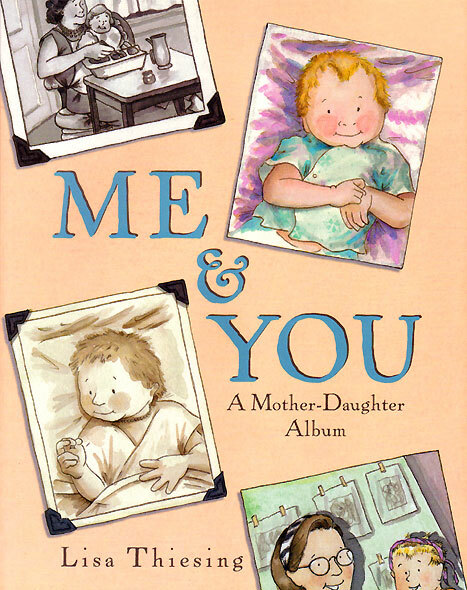 When I wrote my first picture book, Me &You, my daughter was very little and she kept doing things that I used to do when I was that age. So I kept saying to her that I used to do whatever it was, just like you! That would be my beginning. And I knew I wanted to end it with And when I grew up, I wanted to have a little girl…just like you! I had a beginning and I had an ending. I just needed to fill in the middle. I had lots of photos of me and Katherine doing the same things but completely differently. So that took care of the middle. And with the photos for reference, I was able to tell the other part of the story – the differences in time, place, personality, attitude – through the illustrations. LT: I really like the early reader genre. So people like Arnold Lobel, Syd Hoff and James Marshall are particularly inspirational. LT: My first book assignment was The Ghosts of Hungryhouse Lane by Sam McBratney. I had been taking my portfolio around to all the various publishing houses for a couple of years, with no luck. I did keep working on my portfolio, showing it again and again, and kept sending out postcards to editors. 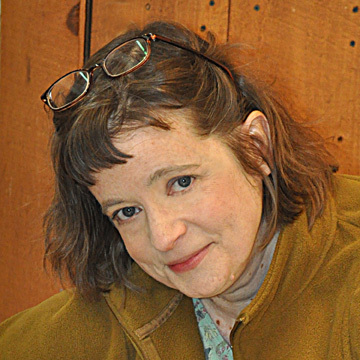 I was close to giving up when the phone rang and it was Brenda Bowen, then at Henry Holt! She asked if I might be interested in illustrating a middle grade novel! I nearly fell on the floor! I thought to myself, “Are you kidding me?!? !” But I was cool and instead shouted, “YES!!! !” I got to go to her office, but now as an actual illustrator because I had a real book to do and we’d talk about our project! It felt wonderful. LT: It seems I often get ideas for stories while driving. I don’t know why that is. Or doing the dishes. 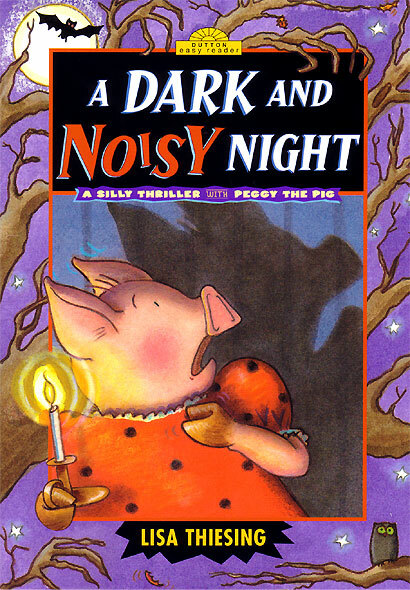 My Peggy the Pig books were adaptations of stories I already knew. 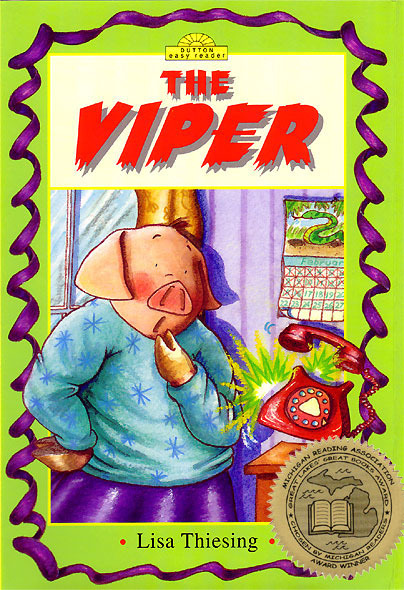 The Viper is based on the old campfire scary joke. The Aliens Are Coming! is a variation on War of the Worlds. A Dark and Noisy Night is a combination of The Tell Tale Heart and my cousin’s daughter’s fear that the tree branches scratching at her window were witches’ fingers! And The Scarecrow’s New Clothes is from an old story a friend’s mother used to tell. If I’m illustrating someone else’s story, then the ideas, of course, stem from the story. Except that I do get to make the characters look how I want and set the scenes where I want. It’s like being a movie director. You get the story and then you can interpret it visually as you like. LT: That’s a difficult question. A couple of things come to mind. A few parents have told me that their children actually learned to read with my All Better book. That is really gratifying. There is a lot of repetition in that book and it was my goal to help kids learn to read and to enjoy it. And they did! LT: So, yes, I do school visits. I have a PowerPoint presentation of one of my books, complete with sound effects! Currently I’m doing The Viper. There’s also a little bit about printing and binding because I have found that kids really want to know how a book is actually made. My books are geared toward K-4 and I prefer smaller groups. After we do questions and answers, I also give a short drawing lesson. I’ve been using basic shapes and have the kids follow me step by step. We draw Peggy and also do other animals or a scene. All of them, even the youngest, have made beautiful, wonderful pictures which they are really excited about. SLH: Do you attend writer’s conferences? LT: I have attended conferences. I think they are valuable when you are starting out because they do provide a lot of information. Sometimes there is a really great keynote speaker and that can be inspiring. SLH: What has been your best-selling book so far? Which book’s sales (if any) did not do as well as expected? Why do you think that might have been? Have all your titles earned out? Are they all still in print? Have sales affected publishers’ willingness to do further projects in a good or bad way? LT: My best-selling books so far have been the Two Silly Trolls books. They were part of the HarperCollins I Can Read program, which is one of the best, most trusted and well-loved group of books ever. So there is a built-in safety umbrella. Both retail customers and educational outlets are going to buy books that are published by them. That doesn’t happen with most books. Most of my books have earned out and I’ve received royalties. But ALL of my books should have sold better than they did and they are now out of print. And that, of course, does affect publishers’ willingness to publish more. 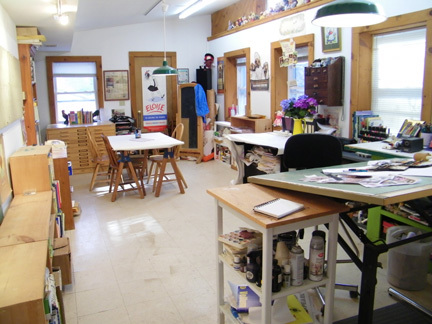 I’ve started giving art lessons to kids in my studio! It’s been really fun! Also, I’ll be participating in the Hudson Children’s Book Festival on May 5th. I would love to see everyone there! It’s a great opportunity for people who love children’s books to come out and meet some of their favorite authors and illustrators. Bring the kids! Reader question: how important is it to have a story? Can you just entertain and make people think, or do you have to have a story to make a picture book? LT: A story is very important. But I’m not sure what you mean by story. Even a concept book about color, for example, is a story. And I think it is tremendously important that a book be entertaining. Reading is fun! A silly book can also be thought provoking and that’s a challenge as a writer for children. Hard copy or digital? Hard Copy. Plotter or pantser? Don’t even know what that means! Day or night worker? Day worker. Quiet or music? Quiet for writing. Music for drawing. Hi Cathy! You're sweet. My teachers at the time weren't as thrilled. Thanks Angela! I'm hoping for a few more dreams to come! Hi Penny! I hope you enjoy the books when you see them! So glad your library had some! Thanks! Hi Erik! So happy that you like the Viper story! Perhaps your library has a copy of the Peggy version. Enjoy and keep on reading! I can't believe Lisa got in trouble for taking a picture of her own book. Seriously, what did the bookstore think was going to happen when she did that???? I love these interviews from an illustrators point of view (even I'm not one). It's gives us a chance to learn about the other side of the process. Terrific interview, Lisa!! I love your illustration style! If I ever sell another pb manuscript, I hope they choose you to illustrate it – I'm not kissing up – I'm serious! This is a great post. I really like your style of writing. I needed to add a bit to my comment…regarding the book sales…it is a sad commentary on our society because some really great books will fall by the wayside if you are not a celebrity…and there is so much stuff out there that is undervalued…I would grab your books in a heartbeat, Lisa! So true, Vivian – both about the commentary and about Lisa's wonderful books! Nice to “meet” you Gina! Thanks so much for visiting! Her work is fabulous, isn't it Lori?! I know – some places have the craziest rules! 🙂 I also love hearing about working form an illustrator's perspective especially since I write PBs – I think it's really important to know how they operate and what we, as authors, can do to make their jobs fun instead of difficult! Susanna, thanks for introducing me to Lisa. I just saw Jane Yolen speak this weekend. She feels midlist authors are important too. She says Owl Moon was never on a bestseller list, but it sells 20k-40k each year. I wish publishers would keep that in mind. Wow! If 20-40k a year (copies I assume) is mid list, just wow! Thanks for introducing Lisa to us. the post was amazing. However I could not get the raffle copter to work. I liked the blog and commented but 'enter' would not go through as well as the rest. None of the others went through. And I would love to win a copy. Lovely interview. I like your inspiration for your book Me & You and the first and last lines you shared. Very precious! Susanna, I like your quick questions. Fun! Glad you liked the interview, Clar, and sorry if you had trouble with Rafflecoptor – I'm still learning it! The one ting you HAD to do in order to complete the rest was answer the first question – who wants the book. If you didn't do that, the rest wouldn't work. But if you did that, the rest should have worked. I will check my Rafflecoptor account and let you know if yours went through or not! Oh! Of course it's YOU, Nancy! Looking forward to seeing you, too. Yes. Nancy is my father's sister. We have Jess and the Stinky Cowboys, a gift from Bhakta, actually. We love your stink clouds! I really enjoyed this interview and getting to know more about Lisa and her work. I used to pretend to be Harriet the Spy also!